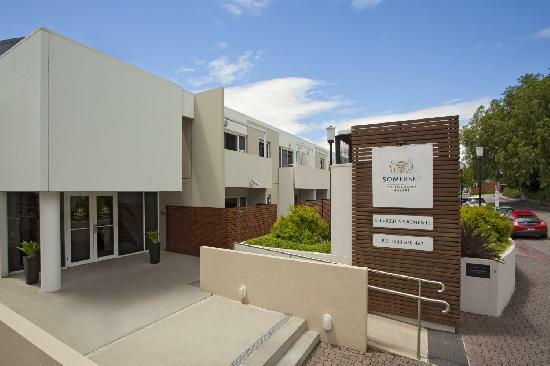 Travellers searching for apartment accommodation in Hobart will enjoy staying at Somerset on Salamanca. These secure and spacious serviced apartments are a welcome alternative to a hotel for executives and international families on project assignment, leisure vacation or relocation. Situated just minutes from the Central Business District and the Salamanca Market, guest staying at the Somerset on Salamanca can stroll from their accommodation to an abundance of business and recreational activities. All types of travellers can take advantage of the discount accommodation at the Somerset on Salamanca, as well as the range of modern amenities including direct internet access, faxing facilities, free car parking, guest laundry, lift, massage, airport shuttle, 24 hour reception and baby cots available. Experience the exemplary service of Somerset on Salamanca in the comfort of your private serviced residence. *** Non smoking Serviced Apartments***** Check-in is via Somerset on the Pier, Elizabeth St Pier Hobart 7000. Apartments are serviced daily except Sundays and public holidays (unless otherwise stated). Rates 14+ days include a weekly service only. Broadband internet access is available in every apartment (cost incurred). Nearby Attractions : Somerset on Salamanca is the ideal base from which to explore Hobart and its surrounds. Just a few minutes stroll to Salamanca Place, Battery Point, Maritime Museum, Museum and Art Gallery and River cruises. Just a few minutes drive to Wrest Point Casino, Mount Wellington, Botanical Gardens, Cadburys Chocolate Factory and Cascade Brewery. Surrounding Areas includes Richmond, Port Arthur, East Coast, Trout fishing, Wildlife parks, Huon Valley, Hastings Caves and Thermal Springs, Tahune Airwalk and National Parks. 1 Bedroom Premier : Sleeps up to 3 guests on 1 King Bed, Or 2 Single Beds. 2 Bed 2 Bath Deluxe Apartment : Sleeps up to 5 guests on 2 King Beds, Or 1 King & 2 Single Beds, Or 4 Single Beds. Studio Executive Apartment : Sleeps up to 3 guests on 1 King Bed, Or 2 Single Beds.